We’re skipping Thanksgiving this year. Yep, phimosis it’s true. I’ll be passing on my favorite food holiday. We’re going to Chile instead to explore the lakes and wine country. It’s a fair trade, viagra dosage I think. And just because we’re not making Thanksgiving for 30 people again this year, doesn’t mean that I won’t be making Thanksgiving recipes. In fact, I’ve already made my favorite Carrot Pumpkin Soup and I plan to make it again this week. Of all the delicious Thanksgiving foods – turkey, gratin, casseroles, sweet potatoes, pies and breads – my most favorite thing on the table is undoubtedly the stuffing. So, when the last-ever issue of Gourmet arrived (so sad) and I spotted a Rye Bread Stuffing, I instantly wanted some. Of course, I didn’t follow the recipe one bit and made my own with spicy sausage and tart dried cherries soaked in cognac. To make it a meal, I stuffed it into roasted acorn squash, but it would be just as good with turkey and gravy. The stuffing was everything I love about the fall. It was moist on the bottom and crunchy on the top. The rye bread gave it a hint of something interesting, a good contrast to the tart cherries. And some chopped and toasted pecans added that little bit of crunch. I might add a chopped apple next time, too. If you want to stuff your stuffing inside an acorn squash like I did, cut your squash in half, brush with olive oil and roast in a 350° oven for 45 minutes. Then stuff and bake, following the instructions at the end of the recipe. In a small bowl, combine the tart cherries and cognac and set aside or soak overnight. Set a large pot over medium-high heat. Once it’s hot, melt the butter and add the onions and leeks, cooking until soft and beginning to brown – about 7 minutes. Add the sausage and brown. Reduce the heat to low. Carefully, cut the bread into small, 1/2-inch cubes and add to the pot. Add the chicken stock and stir until evenly combined. Fold in the cherries and any cognac in the bowl, the pecans and the thyme. Melt a tablespoon of butter in a small bowl and stir in a pinch of salt. Transfer your stuffing to a casserole dish and brush the top with the butter mixture. Bake for 15 minutes. Remove and serve immediately. Serves 4 as a main (with acorn squash) or 6 – 8 as a side. When in doubt, make more – leftover stuffing is amazing. I think you got a pretty awesome trade off for skipping Thanksgiving this year! Good looking dish. Kind of a sweet/sour/tart combo from all of the ingredients. Real hearty too which is perfect for these chilly autumn days. Sean – Thanks :) I can’t wait for Chile. Never been to South America. And I long for chilly weather! We’re still breaking 90 most days. Hopefully, it’ll cool down soon. I saw the recipe in Gourmet as well and bookmarked it. 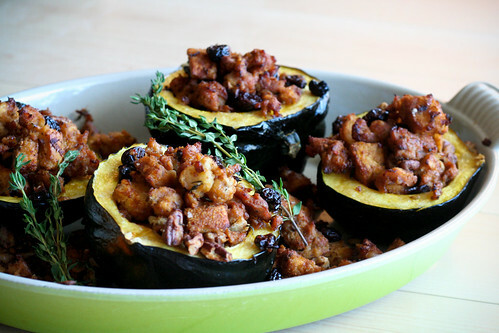 I love how you made it your own and stuffed acorn squash! Have a wonderful trip in Chile! As much as I LOVE Thanksgiving, I would definitely trade it for a Chilean vacation! Enjoy! Oh, and your stuffing looks heavenly! How did you know I was looking for something to do with my two acorn squash? This sounds perfect. I saw this recipe in Gourmet as well and was thinking it sounded delicious. have fun in Chile! This looks EXCELLENT. And I just bought dried cherries and was wondering what to do with them. Looks oh so delicious ! thanks for the wonderful recipe !